Tsunayoshi Sawada Wallpaper: Be Yoursel! 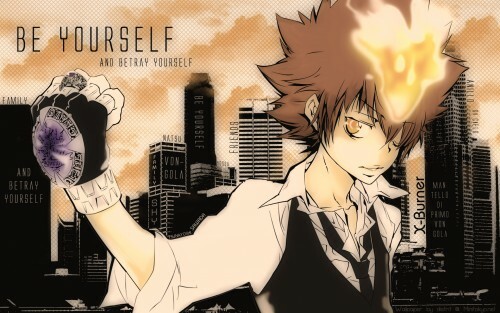 Minitokyo »	Tsunayoshi Sawada Wallpapers » Tsunayoshi Sawada Wallpaper: Be Yoursel! Browse Tsunayoshi Sawada Gallery: Recent | Popular. I like ur message. "Be yourself." Like the texture and effects. I would've liked to see more lively colors, I mean Tsuna is washed away in comparison to the original scan, but I guess his colors fit the bg's colors. And why does the vector looks like it's poorly extracted :/ there's white on his sides. I like the soft colors and lighting in the wallpaper, it's very impressive. Nice vector! It's so cool this pics! Love the wall! Tsuna looks really cool. Love the colors. I think that the Vongola look best in suits. Thanks for sharing! The colors and background looks really good.